The property is a short 5 minute walk to the beach which has numerous bars and restaurants. The closest shop is only 100 meters away. The nearest restaurant is only 50 meters from the Villa. The Villa has a large private swimming pool with plenty of room for sunbathing. The large garden has a brick BBQ on one side and an area for children to play on the other. Inside the Villa is fully fitted with beds for 7 plus enough room to sleep 2 on sofa-beds downstairs. A water dispenser is provided in the Kitchen with water delivered to the Villa. There is a PAYG mobile phone to contact our UK agents. They provide a 24 hour service which includes arranging car hire, days out and also a driver service. They will also fix any problems in the Villa. There is a TV with DVD player. English film, news and children’s channels are available. As well as the driver service there is a Dolmus which runs from the beach area to Fethiye, with connections to the famous beach at Olu Deniz as well as the mountain resort of Hisaronu with its cooler temperatures , fun fair and a floodlit go-cart track. 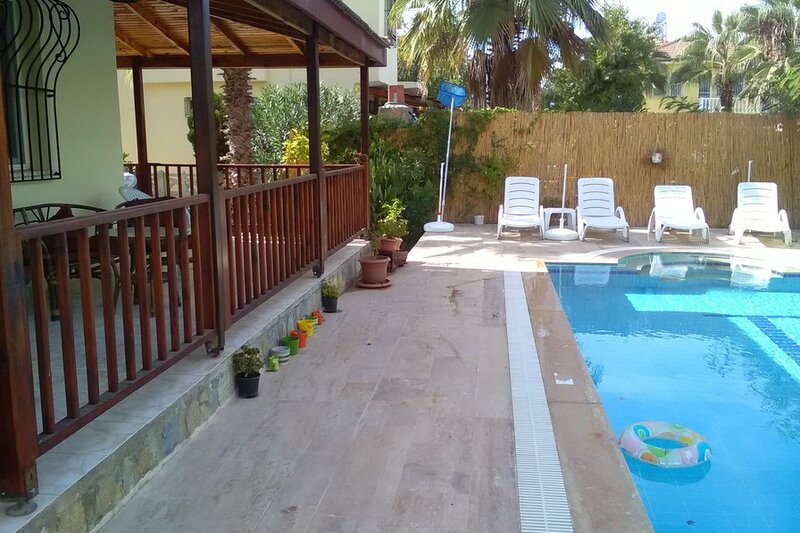 Days out are also available to Saklikent, Dalyan and Marmaris. There are also day trips available to the Greek island of Rhodes. Our agent can also arrange a free day out to the Ghost Village of Kaya. (please see Villa book on arrival for full details).